If there is one thing I have passed on to my children, it is my love of snuggling. You can often find me sat in my pyjamas (oh how I love pj’s) snuggled under a blanket with at least one of the children. Something I encouraged with each of them from when they were babies was to gain comfort from a blanket (as well as a special teddy bear). Even now Roo and Tigger will bring down a blanket from their rooms and cozy up on the sofa to watch a movie. Or if they are feeling under the weather. 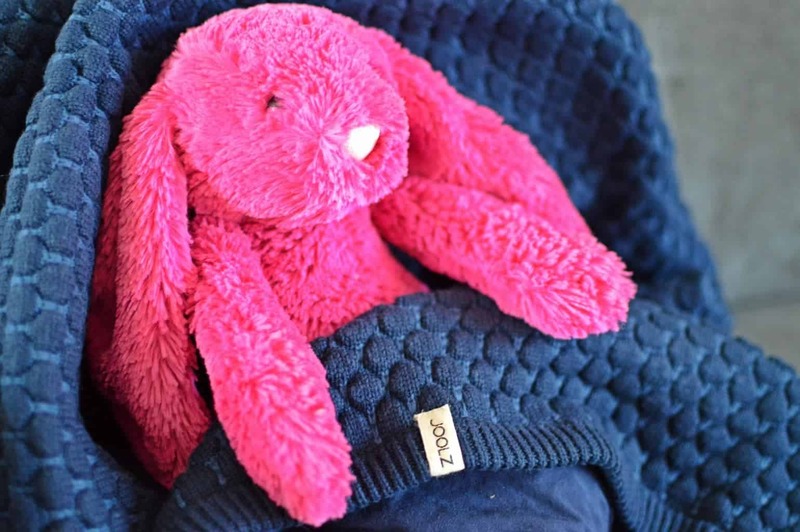 Knowing how much we love to snuggle Joolz kindly sent Piglet a 100% organic cotton baby blanket. In order for us continue our love of snuggling and to keep Piglet warm over the colder months. 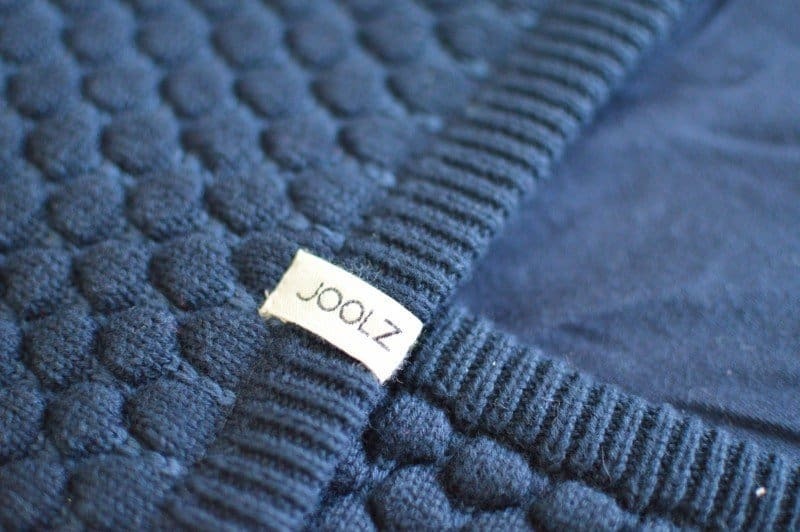 The Joolz Essentials Blanket is available in a choice of five colours, with the traditional blue catching my eye. Arriving beautifully packaged in a simple brown box. There was no fuss, no unnecessary packaging, just a beautiful cozy blanket ready to be snuggled. Hugging and singing lullabies: wrap your baby lovingly in your arms in this super soft blanket right from the start. A honeycomb pattern has been knitted into the outside layer – because children like bears and bears like honey. The Joolz Essentials blanket is quite a weighty blanket, however, I like that. The trouble with lightweight blankets is that they have a tendency to slip off or get caught by the wind when you’re out and about. This double-sided blanket offers a choice of look between the honeycomb pattern or the plain cotton side. Personally, I love a bit of texture and love playing with the honeycomb whilst we are snuggling. Complete with a thick knitted hem along all four sides finishing the look of the blanket. Our love of snuggling means that a blanket is used almost everywhere we go. From cot to couch, car seat to picnics and playdates to doctor appointments. And when Piglet (or any one of us) isn’t snuggling up in her Joolz blanket it is used during playtime. Ideal for setting out tea parties or keeping her favourite Jellycat rabbit safe and sound. Now if only they made an adult sized blanket I’d be very happy! 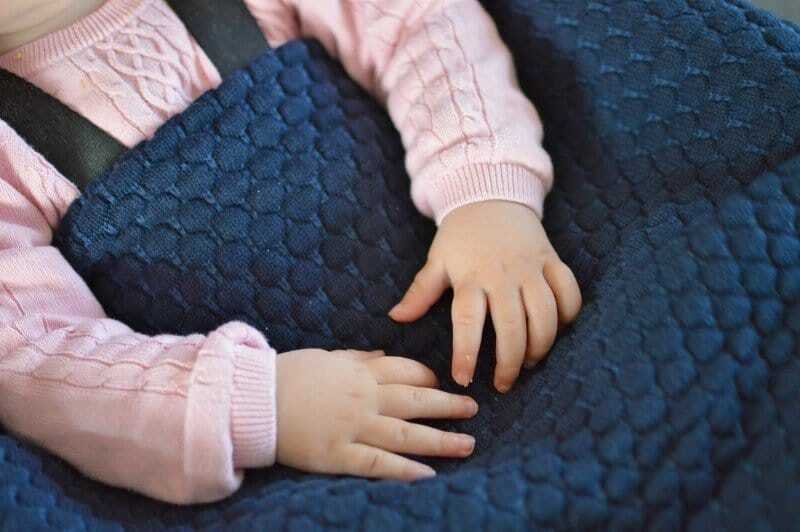 The Joolz Essentials blanket is available directly from Joolz and other leading baby retailers.